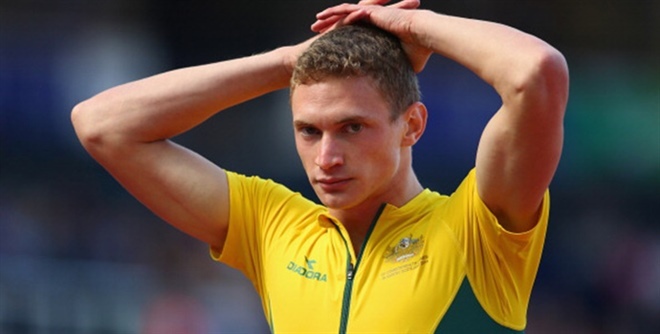 The Australian athletics team at the 2014 Commonwealth Games has continued to enjoy strong results in the morning session of Day 2 of competition at Hampden Park in Glasgow, Scotland with 2012 Olympic finalist Steve Solomon (NSW) easily advancing to the second round of the hotly contested men’s 400m. Racing in one of the deepest events in Glasgow, Solomon clocked 46.26, easing down to finish in second place in his heat and earn a coveted automatic qualifying spot for the next round. Solomon said he was glad to have his first run in Glasgow under hos belt so he could now focus on the semi-finals on Tuesday. “I did exactly what I needed to,” Solomon said. “I think I set my race up well and it was my first hit out in a fair while so it was good to get rid of the rust and come back tomorrow firing. The women’s 1500m heats provided some unexpected drama, as the Commonwealth Games record was broken in the first heat and there was a protest around the second. In heat one, Kenyan Hellen Obiri ran a scorching 4:04.43 to break the Games Record. Australians Melissa Duncan (VIC) and Kaila McKnight (VIC) benefitted from the fast pace, with Duncan running a personal best of 4:05.76 to finish fifth and McKnight a season’s best time of 4:06.06 in sixth. In the second heat, Australia’s 2013 IAAF World Championship 1500m finalist Zoe Buckman(VIC) led early but was the subject of some interference and faded to finish sixth in 4:11.56 and outside the qualifying group. The Australian team subsequently lodged a protest to the jury based on interference coming into the final lap, but it was dismissed and Buckman will miss the final of 12 as the thirteenth fastest athlete. There was good news for Australia in the men’s high jump qualification too, as both Nik Bojic (QLD) and Brandon Starc (NSW) advanced to the Final on Wednesday after each successfully clearing 2.20m. Bojic had a perfect series of jumps, clearing 2.06m, 2.11m, 2.16m and 2.20m all on first attempts. Starc had to work harder and needed gutsy last-ditch clearances at both 2.16m and 2.20m to ensure he made the final. In the men’s hammer qualification round, Tim Driesen (ACT) threw a season’s best of 69.63m to ensure a place in the final on Tuesday. Driesen finished with the fifth longest throw of all competitors in either group. Fellow Australian Huw Peacock (TAS) reached 63.95m with his furthest qualifying attempt, but it wasn’t enough to advance and he finished in 14th overall place. In the first day of the men’s decathlon competition, after three completed events Stephen Cain (VIC) sits in 15th place and Jake Stein (NSW) is 18th. Stein started the competition with a decathlete’s worst possible nightmare, false starting twice in the opening 100m and the subsequent disqualification seeing him earn zero points for the event. “It’s a school boy error,” a disappointed Stein reflected. “You learn to start when you are seven or eight and I forgot how to do it today. Stein recovered from his disappointing sprint start to jump 7.15m in the long jump (850 points) and win his group in the shot put with a throw of 14.80m (777 points). Cain opened his decathlon with an 11.33 performance in the 100m (789 points) before reaching 6.73 (750 points) in the long jump and 13.87m (720 points) in the shot. In the men’s T37 100m Sean Roberts (SA) successfully advanced to the next round. Roberts ran third in his heat in the time of 12.99 (+0.1 wind) to earn an automatic qualification place in the round of eight. Competing in the opening event of the day, Paul Raison (SA) and Don Elgin (VIC) both made the top-eight of the men’s F42/47 discus throw. Raison came seventh with a throw of 44.44m (723 pts) while Elgin threw a new personal best of 37.72m for 510 points and eighth place in the final. Elgin, a veteran of Paralympic and IPC World Championship competition said afterwards a top eight finish was a pleasing result. “The plan coming into this was to make the top-eight,” Elgin said. “That was what I knew I was capable of and it’s great to have achieved the goal. The 2014 Commonwealth Games commenced in Glasgow on Wednesday 23 July, with athletics competition spanning seven days from Sunday 27 July. The competing Australian athletics team is 98-strong, the largest ever to compete in the green and gold offshore.